There are only so many days designed to celebrate you and your achievements. Weddings come around once (ish) in a lifetime, and while birthdays may happen on the regular, throwing a blowout bash once per year may seem a wee bit gratuitous. Graduation parties happen rarely enough to be truly special — and no one will blame you for going all out. 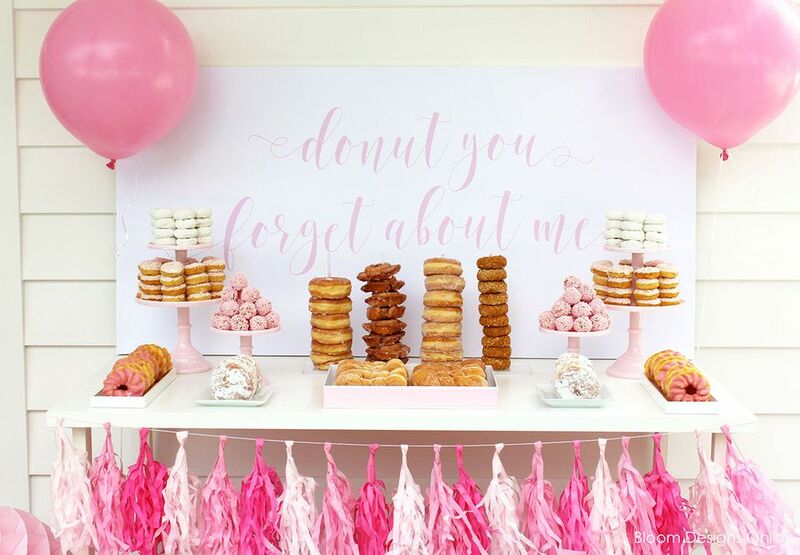 Whether you — or your child or dearest friend &mdash are graduating from high school, college, or kindergarten, take your party decor to the next level. These decorating ideas promise to make your celebration the hottest ticket on the graduation party circuit. A good party requires a little glitter — but cleaning up the resulting mess is an easy way to sour an otherwise-sweet mood. Get the effect without the mess with these glitter-filled balloons from One O. By using larger glitter granules, you can avoid the pesky stuck-in-the-carpet post-party clean-up. And the combination of glitz and bouncing balloons promises to liven up the atmosphere. Glitter balloon volleyball, anyone? Hand out your graduation party favors in these glittery, do-it-yourself trays. Creating these glitzy letters is simple enough: just follow the instructions from Live Craft Love. Spell out GRAD or the graduate's name or even the university they'll be intending in the fall. Once these letters are constructed, stuff them full of sweet surprises (maybe the grad's favorite sugary treats?). Whether your graduate wants to celebrate where they're coming or where they're going, let the school colors stand front and center. For a high school graduation party, consider decorating with the colors of your student's future university — and a college or Master's graduate may want to brag about the achievement they just completed. Lee Ann Wilkes used these blue-and-white sweet treats to brag about her daughter's graduation from Brigham Young University. Find the perfect recipes for your featured colors here. Everyone attending the party may adore the graduate, but they all come from different parts of life. Fellow students probably don't know about the 20-pound trout she caught when fishing with her grandfather — and the grandfather may be delighted to learn about the fiesta she threw on the last day of Spanish class. Ask friends and family to bring their favorite photos and display them all in one enormous collage. Blogger Sophia Lee stained two pallet boards to create a striking backdrop for her best shots. And like Sophia, don't limit yourself to photos alone: she also hung up her gymnastics uniform and medals. Celebrate like you're in a museum with this funky creation. Cut out huge letters to highlight the graduation year — or simply "YAY!" — and hang them on streamers dangling from an enormous balloon. Attached to a wall, like in these Studio DIY instructions, this colorful creation seems almost magical. Give your graduate a grand send-off by having guests write down their best wishes for their future. At this gilded woodland graduation party, shot by Kate Aspen, twigs in a jar turn into a wishing tree. Leave out small sheets of pretty paper so your guests can scribble down what they're dreaming of for the graduate — and create a timeless memento. Looking for the perfect graduation picture? This DIY speech bubble allows guests to tell the graduate what they really feel — from "Congrats!" to "Keep in touch!" Or create a fun photo shoot by scribbling "I'm done!" on the chalkboard, like blogger The Paper Curator did for her graduate friend. This simple craft only needs some scrap cardboard and chalkboard paint. Keep the graduation going even after the ceremony is over. These clever straws promise to add some zest to your beverage table. Combined with colorful drinks — strawberry lemonade is the perfect summer treat — these DIY creations from The Idea Room provide just enough quirky decor. Want to go the extra mile? Wrap a colored band around glass bottles to create a cohesive display. It's 2018. What's a party without a photo booth? But a graduation party — well, that needs something extra. This glamorous rose-gold photo booth from Lauren Conrad combines confetti, traditional peachy balloons, and enormous number balloons (spelling out the year of graduation, of course) to give the party a fun glitzy effect. There's a good reason Oh The Places You'll Go is a classic graduation gift. Dr. Seuss understands the plight of graduates like no one else. So why shouldn't it be the perfect grad party theme, too? A Night Owl concocted a brilliant and playful kindergarten graduation theme. Create the quintessential kickoff for your loved one — both young and old — with colorful cookies, a sea-blue suitcase and (of course) a globe. The classic senior-year superlatives can make fantastic graduation decorations. Studio DIY hung Polaroids from balloons and scribbled on superlatives — think, best hair or cutest couple — to create a immersive atmosphere for all of your guests. Better yet: have guests vote on who should win which award.